Nick Schultz | The Phoenix Loyola senior outside hitter Collin Mahan racked up 13 kills in the loss to UCLA Jan. 31. The No. 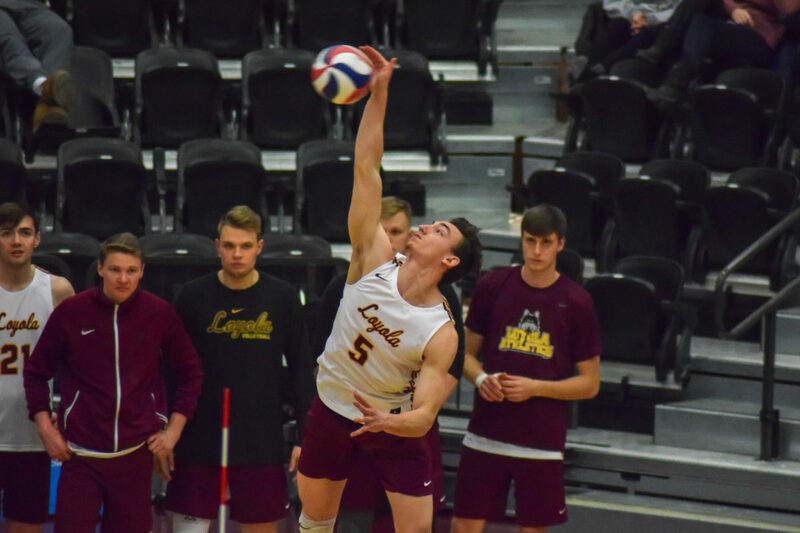 7-ranked Loyola men’s volleyball team (6-3) struggled to capitalize on key opportunities as it lost to No. 5-ranked University of California, Los Angeles (UCLA) 3-1 at Gentile Arena Thursday night. Senior outside hitter Collin Mahan led the Ramblers with 13 kills, and senior outside hitter Will Tischler recorded 10. Sophomore setter Garrett Zolg contributed 34 assists and a team-high four service aces to the effort. 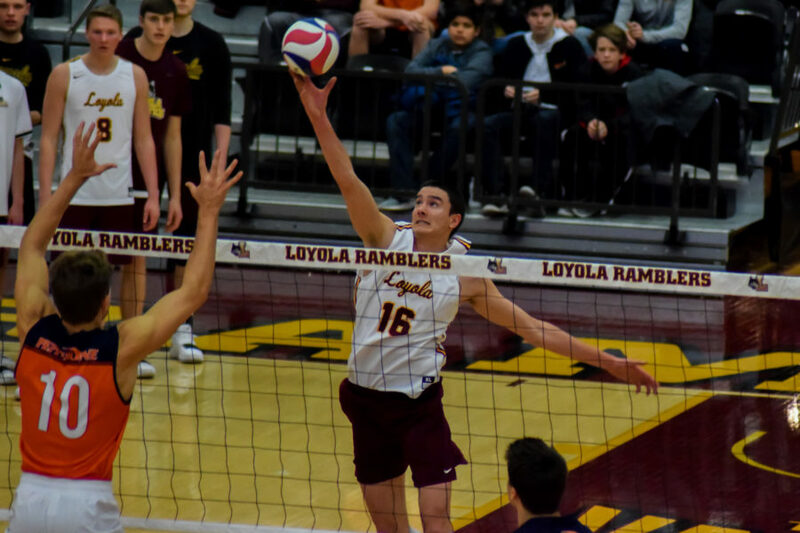 Loyola got out to an explosive start in the first set, scoring the first six points of the match, but went on to lose the set 27-25 despite serving on set point. The next three sets were back-and-forth, and neither team led by more than four points. The Ramblers held on to take the second set 25-23 to even things up 1-1 before UCLA took the third stanza 25-21. The Ramblers led for most of the fourth set, but never created enough separation. UCLA took timeouts on back-to-back points when Loyola had an 18-14 advantage, then came back outscore the Ramblers 11-7 run to seal the win with a 25-23 win in the fourth frame. UCLA, the runner-up in last year’s NCAA Tournament, improve to 7-2 with the win. The Bruins were led by junior middle blocker Daenan Giymah’s 18 kills and senior outside hitter Dylan Missry’s 11. In such a close match against a top-five opponent, Mahan said the pressure can get intense. But he said maintaining a tunnel vision and trusting his teammates are the keys to maintaining composure. Nick Schultz | The Phoenix Senior outside hitter Will Tischler recorded 10 kills in the loss to UCLA Jan. 31. 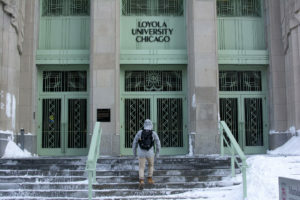 Loyola is next scheduled to play Penn State University Feb. 2 at Gentile. First serve is scheduled for 3 p.m. and the match will be broadcasted on NBC Sports Chicago.